Bold and the Beautiful spoilers reveal Liam Spencer (Scott Clifton) and Hope Logan (Annika Noelle) try to remember everything that happened the night their daughter Beth Spencer (Rosalind Aune and Isabella De Armas) died. The two have struggled to come to terms with life without their baby. As they think back on that tragic moment, will they realize that something is amiss? They need answers but may need some help to get to the truth. 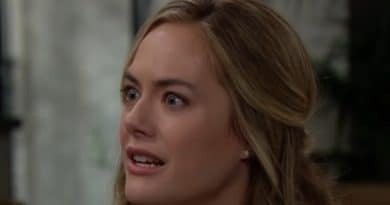 According to recent Bold and the Beautiful spoilers, both Hope and Liam try to remember all the details of the awful night when they lost their daughter. As they both have been struggling to come to terms with what happened, they might feel remembering the details and finding answers will help them move on. However, as they remember the night, will Hope Logan realize that Reese Buckingham (Wayne Brady) lied to her about her baby’s death? They could realize something is amiss as they go through the night, step by step and things don’t add up. But what really happened is unimaginable, so they won’t figure it out. The question is whether reliving the worst night of their lives will help or hurt Hope Logan and Liam Spencer. Both have struggled in the last few episodes of Bold and the Beautiful. Will reliving their child’s death help them in any way – or just make everything worse? Previously on the show, Liam Spencer revealed to Hope Logan that he was having a hard time with his grief. He feels more than a little guilty over his late arrival to Catalina Island. He thinks that if he was there earlier, maybe he would have been able to help Hope more. Liam wonders if somehow, he would have been able to save the baby. Of course, Liam Spencer’s late arrival has nothing to do with Beth’s death on Bold and the Beautiful. In fact, Beth isn’t even dead. However, the duo doesn’t know this, so they continue to think of things they could have done to have changed the terrible outcome. The only thing that has really helped Liam and Hope Logan find happiness amid their turmoil has been Steffy Forrester’s (Jacqueline MacInnes Wood) baby Phoebe. Of course, viewers know that this baby is really Hope and Liam Spencer’s child. However, both of them bonded with the baby. But in Hope’s case, this happiness could slowly turn into something a bit more obsessive. According to previous B&B spoilers, Steffy grows worried as Hope Logan gets closer with Phoebe. While Steffy obviously knows that she is going through a hard time, the amount of time Liam’s wife spends with Phoebe seems unhealthy. Steffy worries Hope’s connection with her daughter has almost become obsessive. Of course, Hope doesn’t understand the indescribable bond she has with Phoebe. While Bold and the Beautiful viewers understand that she’s feeling a mother-daughter bond with her child, no one else does. Steffy Forrester, more than anyone, doesn’t understand it. While Hope originally feels happy when she’s with Phoebe, this could quickly turn to something worse. Could this little baby tear the two women apart even more – and will Liam be able to stop the two from making matters worse? Watch CBS daytime next week to see Liam Spencer and Hope Logan revisit the tragedy of losing their baby. Also, you can make sure to head on back to Soap Dirt daily for all the latest Bold and the Beautiful spoilers. ‘Bold and the Beautiful’ Spoilers’: Steffy Tricking Hope and Liam – Is Ring an Evil Ploy? ‘Bold and the Beautiful’ Spoilers: Hope Baby Plot Drags On – Months More of Agony?